Technical analysis is the most basic part of the investment process, but all too many Financial Advisors and Financial Planners aren't aware that it is. This book describes the essential basics of technical analysis of financial markets that Financial Advisors and Financial Planners absolutely must know. The material is presented in a concise, easy-to-understand and well-illustrated format to keep reading time to a minimum. Written by a market technician with 50 years of experience, this is the best explanation of the essential basics of technical analysis that every investor needs to know available -- and a must read for every Financial Advisor, Financial Planner and stock broker. "As advertised. Clear basic essentials on a subject that is often presented with enough confusion to be useless. Thank you." "Walt has seen markets change since the 1960s and in this book, he shares what's worked for more than 50 years. It's a short book because Walt didn't keep writing just to meet a minimum page count. He said what needed to be said and stopped writing. Readers benefit from his experience and are ready to implement a basic and successful approach to technical analysis in just a few hours." "Written by a pro, this book has everything the investor needs to start using technical analysis. It's a clear look into the types of strategies that professional market technicians use to manage money successfully." "Technical analysis is the most basic part of the investment process. However, all too many investors aren't aware of this. Local author and market technician Walter Deemer, a cornerstone of technical analysis for nearly 50 years, describes what every investor needs to know in his newest book, The Essential Basics of Technical Analysis. This is the best explanation of technical analysis and is a must read for everyone involved in the stock market. 'This book is a very simple explanation of the absolutely-necessary role technical analysis plays in the investment process,' says Deemer. He emphasizes several simple concepts, such as a stock is not the same as the company and price is everything. Deemer says that a chart is worth a thousand numbers. 'You can get 90 percent of the information from a stock chart in 10 percent of the time,' says Deemer, 'but it takes the remaining 90 percent of the time to get the other 10 percent.' The material is presented in a concise (66 pages), well-illustrated and easy-to-understand conversational format without the usual technical mumbo-jumbo. He has a way of explaining technical analysis in terms that anyone can understand." 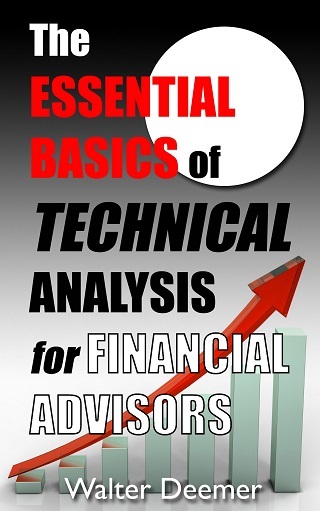 The Essential Basics Of Technical Analysis is only available as an e-book. You can get it either at Amazon or on iTunes.